We are looking for a second venue for 21 November on our way back. People interested to put us up somewhere in North Germany can always get in contact with us. The October 2009 newsletter from the Colorado Case Company (USA) reports on the outcome of the company's trade mission to Europe, mentioned in the European Bluegrass Blog on 3 June. One result is that Hiscox lightweight hard-shell cases, made in the UK, will be part of the CCC product line, and the CCC offers a 20% discount on any Hiscox case bought from them during October 2009. At present the Hiscox range includes cases for guitar, violin/viola/cello, and horns; banjo and mandolin cases will soon be added. The CCC's featured dealer for October is also in the UK: Jonathan Myall Music, Europe's largest supplier of flutes and flute music. The full Colorado Case Company newsletter for October 2009 can be read here. The first Moniaive Bluegrass Festival was held last weekend in Moniaive, south-west Scotland, with a lineup that included Wayne Taylor and Appaloosa (USA) as the headline act, as well as L.Bow Grease from Germany. Musicians from Northern Ireland who took part report that the festival was well organised and a resounding success, and that all bands were excellent. More details are on the Bluegrass Ireland Blog. Nechville Musical Products announces a Banjo Summit Reception to be held as part of the IBMA World of Bluegrass in Nashville. The event takes place in Room 1809 of the Renaissance Hotel on 1 October from 2.00 to 4.00 p.m. There will be refreshments, discussions, product sampling and of course, jamming! We at Nechville hope to see you all there! 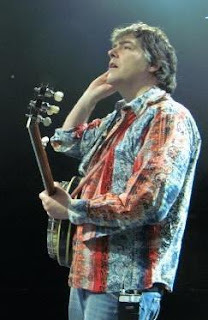 Béla Fleck & the Flecktones will be playing a brief European tour at the beginning of November 2009, with two dates in Ireland and two in Spain. In addition to the show in Dublin on Wednesday 4 November shown on their website, they will be playing the previous night (Tuesday 3 November) in the University Concert Hall, Limerick, according to fliers distributed at the Johnny Keenan Banjo Festival this weekend. For further info on this show, ring 087-281-7825; box office 061-331549. After the Dublin show, the band will travel to Spain to play in Barcelona (5 November) and Cartagena (6 November). For more details, see their website. Following a very successful 1st European Bluegrass Summit in Bühl, Germany, last February, the European Bluegrass Music Association was implicitly asked to take up the thread and offer the platform for a follow up. Also, this event is fully supported by IBMA as a major and effective tool to bring the scene together more closely and to find ways to fulfil the goals set at the first meeting. Therefore, EBMA is happy to now announce that arrangements to hold the 2nd European Bluegrass Summit on the weekend of 5-7 February 2010 have been made. The convention will be generously hosted again by the city of Bühl offering the entire meeting facilities and infrastructure for free. A free bluegrass concert will entertain attendees on the evening of Saturday in the famous Bühl Schüttekeller, also sponsored by the City. As last year, attendees are invited from all quarters in Europe, the costs and arrangements for travel, subsistence and accommodation are the entire responsibility of the participants. The summit will be limited to 40 delegates and early booking is advised. Further information and proposed schedule are attached here (EBS2010_schedule.pdf). 1. Circulating this proposal as set out in this e-mail to others who you know to be interested and involved in European Bluegrass. Oliver Waitze of the New Acoustic Gallery in Solingen, Germany, reports that a weekend mandolin workshop, led by Jesper Rübner-Petersen, will be held from 30 October to 1 November 2009. The numbers that can take part are limited, so anyone interested should enrol as soon as possible. Cost: €165. The themes will include bluegrass, fiddle tunes, rhythm, double stops, scales... For booking or further info contact Oliver Waitze at the NAG by telephone (+49 (0)212/2474007) or e-mail. Oliver himself will conduct a Flatpicking Guitar Workshop on 21 November 2009 from 10.00 a.m. to 5.00 p.m. This is for anyone who wants to improve their plectrum playing, and all levels are welcome. The scope ranges from bluegrass, fiddle tunes and variations, rhythm, scales, swing, melody, right-hand exercises, Lester Flatt G-runs, endings, to lead picking and crosspicking in the styles of Clarence White and Tony Rice. Contact data as above. 31 Oct., 8.00 p.m.: Swing with the Trio Vibracao (Oliver Waitze, Jesper Ruebner Petersen, Max Schaaf). €18 VV; €22 AK. 6 Dec., 8.00 p.m.: Beppe Gambetta. €18 VV; €22 AK. Includes new CD presentation, Rendez vous. 'One of the true live master innovators of the acoustic guitar'. Since August 2009 the British Bluegrass Music Association (BBMA) has sent out to all its members the first two issues of a new 'semi-regular' e-newsletter providing bluegrass and old-time news from Britain, Ireland, the USA, and elsewhere. Inquiries about being added to the circulation list should be sent by e-mail to Richard F Thompson, editor-in-chief of the BBMA's quarterly journal, British Bluegrass News. Thanks to Richard F Thompson, editor of British Bluegrass News, for the news that Rex Preston of Bath, England, who plays with the Scoville Units band, took the #3 award in the mandolin contest at the prestigious Walnut Valley Festival in Winfield, Kansas. Several entrants from outside the US took part in the mandolin, banjo, and guitar contests; pickers from the UK seem to have been the only entrants from Europe. For more details, see the original Bluegrass Blog. Lluís Gómez of Spain (above) is one of the 'Famous Revolutionaries with Nechvilles' whose pictures appear on a Picasa web album set up by Tom Nechville of Nechville Musical Products, who was in Europe during June-July 2009. Lluís also appears in the summer 2009 issue of the Nechville News among six 'Nechville players around the world' - the others are Lubos Malina of Druha Trava (CZ), Leon Hunt (GB), Andy Glandt (D), Jean-Marie Redon (F), and Hiro Arita of Japan. Lluís Gómez will be leading the Barcelona Bluegrass Band in the Johnny Keenan Banjo Festival, held from 24 to 27 September in Longford town, Ireland. Howard Burton (banjo), Mark Jones (guitar), Charlie Ogunremi (mandolin), and Richard Eyres (bass) are all seasoned bluegrass performers in their own right, have played in bluegrass bands all over the world, and are presently based in East Anglia. They combine to give their individual touch to great traditional bluegrass songs and instrumentals, contemporary songs, and original material. Thanks to Liz Meyer for news from the Folk & Bluegrass Radio Airplay Chart, which is now also the official chart for the Folk Alliance. The following facts come from the August 2009 chart, compiled by Richard Gillmann from FOLKDJ-L radio playlists, and based on 15,350 airplays from 140 different DJs. Jonathan Edwards's album Rollin' along (produced by Liz for Strictly Country Records) is at #4 among top albums and songs for August 2009, while Liz's own THE STORM (SCR-59) is at #15 - no small achievement for an album released in 2005. In the chart of top songs for August 2009 Jonathan Edwards's 'Red light, green light' from Rollin' along is at #18, and Edwards shares the #6 place among thirty-eight Top Artists of the Month with Catie Curtis, while Liz herself appears at #23. Strictly Country Records appears at #11 among the forty top labels for the month. These lists are compiled and posted every month (since October 1997) to the official FOLKDJ-L website, where the archive of past Top Album lists is also available. An extended version is at Richard Gillman's personal website. G2 not only has a beautiful new website, with lots of news and information and great pics, but also they are scheduled at the Bluegrass Legends Concerts in Chicago on SATURDAY, SEPT. 26, 2009 at 8pm (Doors at 7) in the format of an International Night! If you're there, make sure to attend! Why are these men smiling? Find out by reading G2's latest e-newsletter online here. Recording artist singer-songwriter Ruth Dillon brings her original bluegrass and country songs to Longford, returning with the Molly Hicks to the Stillery, Friday, 25 September, 10 pm, preceded at 8 pm by a bluegrass session, led by top-notch banjoist Tom Hanway, who recently appeared on TV3's Ireland: AM with American country singer Jack Grace. The Molly Hicks are an original and contemporary bluegrass unit based in Galway, featuring Ruth Dillon (vocals/guitar), Bernie O'Mahony (vocals/guitar), Tom Hanway (vocals/5-string banjo) and Peter Akerstrom (vocals/guitar). Ruth will try out her many new original songs, singing duets with Bernie, and trios with Tom, who also adds hot original banjo tunes. This tight vocal group is revered in Galway and across Ireland for their uncanny delivery of traditional and contemporary bluegrass songs. The Molly Hicks are a harmony tour de force, with everyone taking turns singing lead and harmony, doing call and response, in the grand traditions of American bluegrass, full-grown gospel and country music. Ruth, from Clonmel, Co. Tipperary, has toured America and Europe with the Dolores Keane Band. As a solo performer, she has opened for such acts as Altan, Sharon Shannon, Francis Black, Ron Sexsmith, Juniper and Sean Tyrell. Bernie O'Mahony, originally from Waterford, is a professional studio singer and recording artist who has performed with Sean Tyrrell's highly acclaimed show The Midnight Court. She and Ruth have been collaborating in Galway in recent years, performing at festivals, touring in Ireland and America, and holding down a monthly residency at the prestigious Crane Bar in Galway. American ex-pat Tom Hanway composes on banjo and has three albums distributed globally on the major digital stores. Tom's debut CD Bucket of Bees, waxed in Nashville and New York City, saw him working with top bluegrass artists Sam Bush, Jerry Douglas, Stuart Duncan, David Grier and Vassar Clements. Hanway wrote seven tunes for Bucket of Bees, shifting between bluegrass and contemporary styles. He has developed and helped folk, country and bluegrass artists on dozens of recordings on both sides of the Atlantic. Please come meet the Molly Hicks at an intimate venue in Longford town, and help them celebrate the release of their thirteen-song recording, with new, original and traditional songs. 29 Strings from the Slovak Republic will be among the bands taking part in the third Dare to be Different Showcase at the Banquet Hall and Theater, Bell Buckle, TN, on Sunday 27 September 2009. The event was founded by Valerie Smith, who has made several tours in Europe with her band Liberty Pike. Ticket sales benefit the Foundation for Bluegrass Music, which supports educational programs on bluegrass music through both materials and scholarships. US musicians also taking part include Valerie Smith & Liberty Pike (based in Bell Buckle) and bands from Alabama, Georgia, North Carolina, Tennessee, and West Virginia. Full details can be seen on Valerie Smith's website and in a special press release. Stefano Santangelo of the Mideando String Quintet (Italy) reports that the band is available for bookings in 2010. The MSQ performs original acoustic music and covers from a wide variety of styles on mandolin, octave mandolin, mandocello, violin, acoustic or nylon-strung guitar, and electric bass, with five-part vocal harmony. At the EWOB Festival in the Netherlands the band won the 3# European Bluegrass Band award in 2003, and the 1# award in 2006; as a result they represented European bluegrass at IBMA's World of Bluegrass 2007. Their version of 'Talk about suffering' appeared on the EWOB 2003 CD and the compilation 10 years of EWOB (both from Strictly Country Records). Their CDs Viaggio (2005) and Tutte le direzioni (2007) have earned critical acclaim and received much airplay. They have also played at many other events including the 40th Montreux Jazz Festival and the La Roche Bluegrass Festival 2008 at La-Roche-sur-Foron, France. The full text of Stefano's release can be read here. The original Bluegrass Blog carried yesterday a post on the forthcoming appearances in the USA by the G2 Bluegrass Band (Sweden), #1 European Bluegrass Band 2007. These include playing on the IBMA Awards Show, where they will be the first European band ever to do so. The post also includes sound clips from their next CD (still in preparation) and a video from the band's show at the Station Inn in Nashville during their 2008 visit. Thanks to Lilly Pavlak for a report and photos of the 11th Sunny Mountain Bluegrass Festival, held a week ago in the Lommis Castle area of Switzerland, and in good weather. The festival had a dobro theme, and plenty of good dobroists were taking part, including Roger Williams, shown below playing with Amy Gallatin & Stillwaters on the last show of a successful three-and-a-half-week-long tour of Europe, with seventeen concerts in five countries. The full text of Lilly's report, with many more photos, can be seen here. The EBMA again will have a booth at IBMA's business conference during the World of Bluegrass 2009. We will have it on 28-29-30 September and 1 October, but not during Fan Fest. Many bluegrass professionals will be there to be informed about what is happening in the bluegrass world. Bands, associations, promoters, etc. who are members of the EBMA can promote their activities at this booth, free of charge. I'm pleased to announce the release of a new album: Casey Joe Abair & Hunter Robertson, If you want to go to sleep, go to bed (Yodel-Ay-Hee 074), an album of old-timey banjo-and-fiddle duets. It comprises seventeen traditional songs and tunes, learnt from a variety of sources - mainly musicians long gone. Samples and more information on the album are here. It is available from CDBaby and Menzies Stringed Instruments and shortly from County Sales and Elderly Instruments, and will soon be available through iTunes, Rhapsody, Amazon, eMusic and other purveyors of fine mp3s as well. This is the place where you want to be if you are a bluegrass fan in Norway. It all started on Monday with a 4-day workshop and ended with a 3-day festival, featuring 33 bands and about 45+ concerts. One great feature this year were two very popular and free children’s concerts on Friday and Saturday. The children’s concerts were followed up with the 'children’s music tent', where they got some hands-on instructions and introductions to the instruments and having fun with some of the musicians. The children were also invited, together with their parents of course, to stay on for free and listen to the first part of the festival concerts each day. where Petr’s friends were basically the workshop instructors. Chatham County Line (USA) has been touring in Norway again this summer, mostly with the Norwegian singer Jonas Fjeld [see the EBB for 25 August]. There has been an increasing number of bluegrass bands on the country and folk music festivals: even on one of the largest rock festivals we had Bluegrass Cwrkot (CZ), Ila Auto, and a few more bluegrassy bands on one of the stages. Meråker Bluegrass & Country Festival had mostly bluegrass bands this year and will hopefully evolve into a yearly bluegrass festival. NoBMA have a series of club nights again at the live music venue 'Herr Nilsen' in Oslo, with bluegrass every second Wednesday night throughout the fall and winter seasons. A new collaboration with a similar venue in Drammen, 'Buddy Scene', has just started with bluegrass on irregular Thursdays; a regular schedule for this venue will be worked out later this fall. This summer was a busy one for Lilly of the West. We traveled to Hungary (Budapest concert), France (La Roche bluegrass festival), and the UK (Sevenoaks bluegrass festival). You can see detailed reports on my website. Half of the new album has been recorded in Sofia, mid July as well. The next session will be in Prague late September with Monogram. I made contact with musicians and festivals in Rumania. One is a singer-songwriter 7-days event in Calafat, on the Danube river. They would welcome a bluegrass band as well, but you have to have a song in Rumanian in the repertoire. Dan Vana, the organizer, has also a radio show and is a musician himself. Another contact is Maria Gheorghiu in Bucharest. She is a well known folk singer and has her own show on Rumanian national radio. There is a country club in Timishoara where bluegrass music could be played. One of the contacts there is Sandy Deac, leader of country music band Desperado. I plan to visit Rumania soon and report more in detail about the acoustic scene there. Early September in the town of Lovech, Bulgaria, I visited the festival of the 'Poets with guitars'. It is a singer-songwriter event, organized by the municipality. It is mostly singers with acoustic guitars, but there are also bands who play folk, blues, country... and why not bluegrass? Musicians get free accommodation, meals, and some gifts from the committee. Fri. 25 Sept. The Fiddle Tree, Birnam, Scotland; evening concert. Tickets available online for credit card bookings. For payment by cheque / cash, tickets will be on sale at Zigzags, Dunkeld 01350 728666 and at Birnam CD 01350 727158. Sun. 27 Sept. Live Theatre, Newcastle; evening concert, Broad Chare, Quayside, Newcastle upon Tyne NE1 3DQ, England. Tel. (0191) 232 1232. A full report by John Sheldon, EBMA national representative for Scotland, on recent, current, and forthcoming SBA activities - including booking and sponsorship facilities, events, and information services - can be read here. ... Everybody was waiting for the best vocal band in Europe, Relief [above]... They had to play several encores, before the enthusiastic audience let them go. Somebody even moved the stepladder to the stage, so the band could not leave... What a conclusion of a great festival! Many thanks to the promoter and sponsor Jiri Toman and his partner in life Marcella Machova [below] for this unforgettable weekend. Read the full text of Lilly's report and see more photos here. We have enjoyed another wonderful year of summer festivals in Switzerland. We enjoyed having Amy Gallatin, Roger Williams, Chris and Sally Jones and Chris's band stop here on their ways through Europe. Add the excellent European and Swiss bands and good weather to the mix and we have a banner festival season to look back on. The long tradition of having largely local events present excellent bluegrass in a festival situation is a 'win/win' situation for the otherwise tiny, but tenacious, Swiss bluegrass community. This community is looking forward to celebrating bluegrass and old-time music at its annual Fan Fest on 7 November. The popular open mike, jam rooms, instrument raffle, and cinema room attracts SBMA members as well as other fans of acoustic music in large numbers. After the succesful show by Randy Waller and the Country Gentlemen (USA) in May (sold-out theatre), the CzBMA is preparing another bluegrass concert. Special Consensus (USA) are coming to Jičín's theatre on 25 October. The show starts early - at 18:00. The 14th Petr Brandejs Band's autumn workshop is taking place in Male Svatonovice on 16-18 October. More than 100 students have already booked their spots; each bluegrass instrument (+vocals) will be taught by Czech and Slovak top pickers. After last year's success with the old-time banjo, this year's special is harmonica. More details here. Petr Brandejs agreed to join his brother's Bluegrass Cwrkot to fill for his old friend and bluegrass teacher Milan Leppelt, who died suddenly in August. Petr will be with the band until the end of the year at least. Peter O. Ruby is succesful in organising 'slow' jams in Prague in the pub U Supa. The event is getting more and more popular. Thanks to Lluís Gómez for details of the Al Ras Festival, which will be held this year on 7 November in a beautiful old theater in Mollet del Valles, near Barcelona, Spain. The lineup includes Hibernia from Mollet del Valles, playing medieval and Celtic music; the Barcelona Ceili Band (Irish music), and four bluegrass bands - Lemak, from the Basque country; the Martin Gross Band (Germany); the Barcelona Bluegrass Band; and Blue Railroad Train (France). There will also be a special programme for children - a tribute to Xesco Boix with children animators Pep López, Mª Josep Hernandez, Angel Davant, Sebastià Pí, Victor Estrada, Lluís Pinyot, Oriol Bàrgallo, Lluís Mº Pallenya, and Noe Rives - and a 'Guitar Extravaganza' with Ricky Araiza, Josep Traver, Miguel Talavera, and Valentin Moya. More details and photos are on the Festival's MySpace site. The Czech bluegrass lost one of its greatest personalities - Mr Milan 'Stranger' Leppelt. He passed away after a wasp bite in his garden on 18 August 2009, not even 50 years old. He was a musician, singer, banjo player and teacher, songwriter, publicist, translator, secretary of the Czech Bluegrass Association, tireless promoter and good, kind and always a helpful friend. Lilly also sends photos of the funeral, including those published here: the church display in tribute to Milan Leppelt (above left), part of the packed congregation (right), and (below) the musical tribute at the graveside by Bluegrass Cwrkot, including Pavel and Petr Brandejs, who were among the original members of the band. A tribute to Milan Leppelt appears on the Bluegrass Cwrkot website. Turquoise, the multi-national band based in France, will be among the headline acts at the 18th Appalachian and Bluegrass Music Festival (4-6 September 2009) at the Ulster-American Folk Park outside Omagh, Co. Tyrone, Northern Ireland. On this trip Jeanmarie Peschiutta (vocals, guitar), Natalie Shelar (vocals, bass) and Jean-Marc Delon (banjo, vocals) will be joined by Martino Coppo (mandolin, vocals), standing in for Christian Séguret. Martino, who is a member of the EBMA board, is no stranger to Omagh, having played there more than once with Red Wine (Italy). The festival programme notes on Turquoise can be read here. Two winners of the #1 European Bluegrass Band award at the EWOB Festival will also be playing at Omagh this year - 4 Wheel Drive (2002) and Acousticure (2008). Thanks to Peter Wroblewski and Friedrich Hog for the news that the Country & Western Friends Kötz 1982 e.V. will hold their International Bluegrass Meeting in the Kulturgewächshaus at Birkenried (89423 Gundelfingen-Birkenried), Germany, from Friday 4 September to Sunday 6 September 2009. Concerts begin at 8.00 p.m. on Friday with Amy Gallatin & Stillwaters featuring Roger Williams on Dobro (USA), GrassCountry with banjo virtuoso Roman Ac (SK), and singer-songwriter Stephen Simmons from East Nashville (USA). Saturday's events begin with a Thanksgiving Party (including an Open Stage) for Eberhard Finke, who is retiring as editor of Bluegrass Bühne after twenty-nine years and 172 issues, though he will continue to write for the magazine. The programme then continues till midnight with bands including Driftwood, Foxchase, the Grassroots Philosopher (Olaf Glaesmer), Rüdiger Helbig & Huckleberry Five, Wolfram Hochstetter, Sacred Sounds Of Grass, and Zydeco Annie & the Swamp Cats (in their acoustic version). At 10.00 a.m. on Sunday 6 September a religious service will be held with bluegrass and country gospel songs from Mandy Strobel and Sacred Sounds of Grass. A special event before the close of the Meeting will be a reunion-concert by Helmut & the Hillbillies. In the 1990s the band was considered one of the best European bluegrass groups, and often played for the Country & Western Friends. More details and photos can be seen on the Friends' website or here. 'What a weekend!' Oliver Waitze reports that many photos from the New Acoustic Gallery's First Mandolin Festival (29-30 August 2009) can be seen online, together with a press report from RP Online Solingen. Among their other appearances in the US this autumn, the G2 Bluegrass Band from Sweden (above; #1 European Bluegrass Band 2007) will be appearing at the American Legion Hall, 1030 Central Street, Evanston, Illinois, as part of the Chicago-based Bluegrass Legends Concerts series, on Saturday 23 September at 8.00 p.m. (doors open 7.00 p.m.). Other dates in their tour can be seen on the band's MySpace site. The Toy Hearts (UK) begin their autumn tour of the US tomorrow (Thursday 3 September) at the three-day Tri-state Bluegrass Festival in Kendalville, IN, followed by six appearances in Texas and a further six in Nashville during the IBMA's World of Bluegrass 2009. Full details of the tour can be seen here. They have also recorded an EP for the tour, with six tracks (five of them original songs). See today's post on the original Bluegrass Blog. Rockridge hollerin', the latest CD by the Rockridge Brothers from Sweden (Pontus Juth, upright bass; Peter Frövik, guitar; Ralf Fredblad, banjo, fiddle; and Kristian Herner, clawhammer banjo), has seventeen tracks of tunes and songs drawn from the core of the south-eastern US old-time repertoire. The album is available from the band at live shows, from Amazon, Ginza, iTunes, or Cdbaby, and via the Brothers' own website.